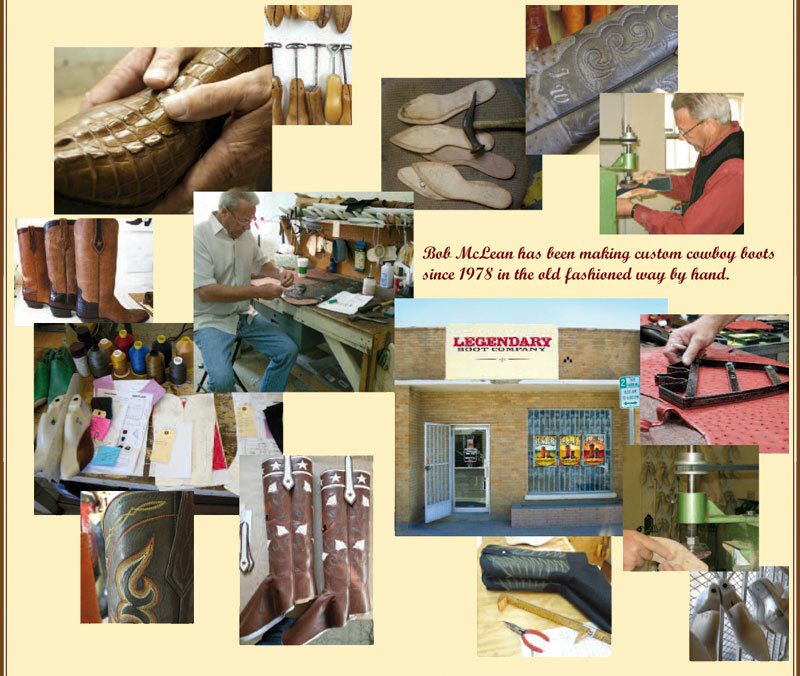 Bob McLean has been making custom cowboy boots since 1978. Starting in Prescott Arizona buying a small boot repair shop where he learned the basics for bootmakers from the ground up. Since those days Bob has worked on his own and has had the opportunity to run some of the best custom bootmaker shops in this country. Most recently as the Master Bootmaker at J.B. Hill Boot Co., a job that brought Bob from Nogales Arizona to El Paso Texas, the bootmaker capitol of the world. After a short time in El Paso Bob started to long for making more traditional cowboy boots in a way that few bootmakers have the skills to do. Bob makes boots the old fashioned way by hand with no computers and built by world class craftsmen with only the best hides and materials. Legendary Boot Company was started to make this goal possible, with the help of two good friends and clients Stephan Thierry and Dirk Lavigne. We have an unconditional guarantee that’s easy to understand. If you are not pleased with your cowboy boots for any reason we will repair, remake or refund your money no questions asked. We look forward to a long relationship with you and we will always keep your measurements on file for future orders. ﻿Legendary Boot Company is truly a custom bootmaker. Seldom are any two boots that leave our shop exactly alike. Although we have standard styles, you can make changes in color and type of leather, toes, heels, height of the top and top shape and design. Many of these selections are on the order form and won’t change the price of the boot. We will be happy to send you leather swatches of any leathers we offer and will try and find other leathers of your choice that are available. If your changes affect the price we’ll contact you before we start your cowboy boots. Special design projects are also available at Legendary Boot Company, we can make boots with brands or your company logo as well as inlays, tooling, just about anything you can imagine. 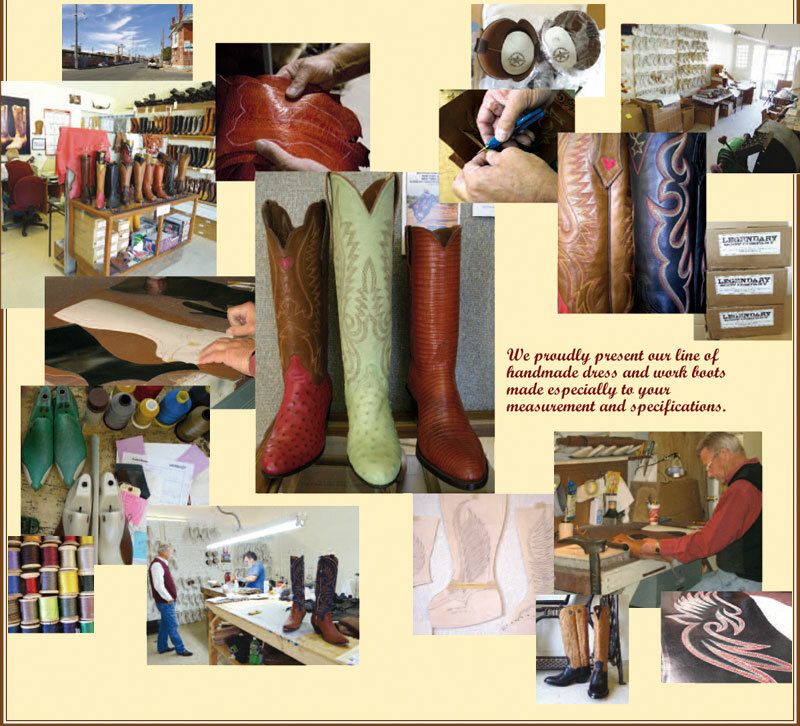 Give us a call with your special needs and ideas and we’ll work out a price and get started on your one of a kind boots.